2011 Birthday Invitation! - Super Inky! Happy November! It's my birthday month! You are all invited to my birthday party! We wish we could come to your party in person, but since we live so far away, please consider us virtual attendees. I live too far also, but, i can attened through my blog and internet!!! My birthday is November 23! Where did you make your invition??? Thank you for the kind birthday wishes. :) I understand that you won't be able to make it down to NYC- that would be a lot of airfare and I don't think my moms would let me have that many guests in the apartment! Hi Violet! That is so awesome that we have the same birthday! Did you know our birthday will be on Thanksgiving in 2017? Beth from Beth's Blog, katie, Andy and Kendall. OO, how exciting Inky! What do you have planned for the party? Is there anything that you're hoping to receive? Hope you have a wonderful birthday and that is so kewl your birthday will be on Thanksgiving in 2017, you should have a lot of fun for that. Hi Inky! November is a wonderful month to be born! I'm down here in Texas, so I'll just be another virtual attendee, but take lots of pictures! Happy Birthday! Thanks for the invitation but I can't come this year. I've got a lot of homework due that week plus its Uncle Bob's birthday on the 29th. I looked over your wish list and it looks nice and varied. Have a wonderful birthday beautiful girl!! Have a great party and some day I hope I can come to New York. 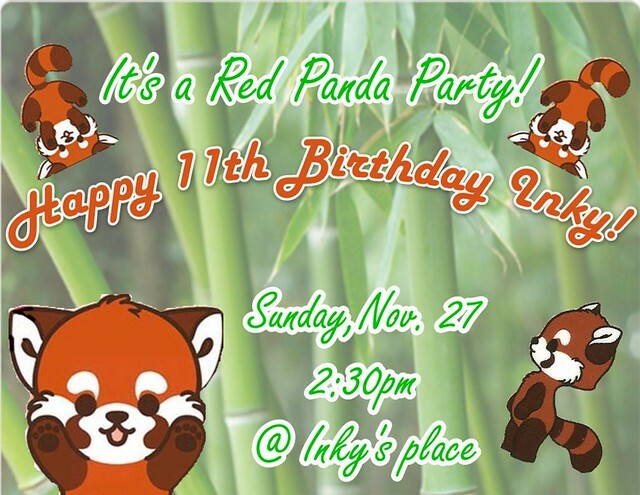 I wish I could come, Inky! That's kind of impossible, though.. I love your invitation! The theme of this year's party looks really cool! Question- why do you always turn eleven? My birthday is December seventh.